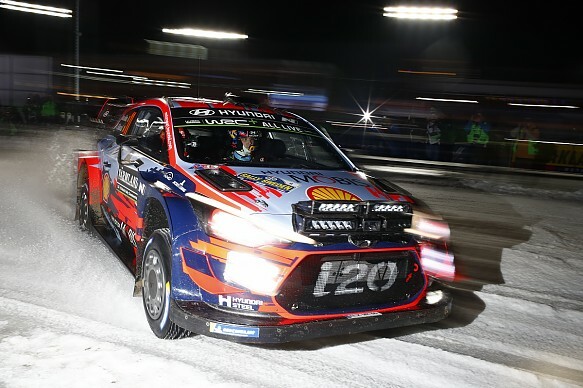 Hyundai's Thierry Neuville posted the fastest time on Rally Sweden's opening superspecial, edging out World Rally Championship rival Sebastien Ogier by 0.8 seconds. Neuville and Ogier were engaged in a final-stage battle for victory on the season-opening Monte Carlo Rally and resumed their fight on Sweden's 1.2-mile Karlstad stage. Citroen driver Ogier ended up second fastest despite running wide at the final corner. It was a common trend on the stage, as the wet, slushy snow reduced grip for all the drivers and created deep ruts. Andreas Mikkelsen holds the final podium place after the short opening test, 1.1s off team-mate Neuville's pace and 0.8s up on Ott Tanak. Jari-Matti Latvala confirmed his status as the most experienced WRC driver of all time by starting his 197th rally, and was fifth on the superspecial - only 0.1s off Toyota team-mate Tanak. Finnish drivers dominated the rest of the top 10, with Teemu Suninen (M-Sport Ford Fiesta) and Citroen's Esapekka Lappi sixth and seventh respectively. Marcus Gronholm, making a WRC return nine years after his last start on Rally Sweden, was eighth fastest, beating long-time rival Sebastien Loeb in a head-to-head contest. Such was the difficulty of Karlstad's slippery surface that WRC2 Pro leader Eerik Pietarinen, who was selected as a factory entrant by Skoda for this event, was ninth overall, tied with Kris Meeke - who had a minor off into a snowbank during shakedown on Thursday morning - and Jari Huttunen. Elfyn Evans, Pontus Tidemand and Loeb were all further down the leaderboard mixed in with WRC2 contenders.